Our flagship NexGenic ImageInbox® app has been engineered to ensure US HIPAA security and privacy policies while performing PACS integrated medical image exchange. Lee Daly’s daughter, Alexandra, was treated at Children’s Hospital Los Angeles (CHLA) for several years, where brain surgeons performed three craniotomies. The family later moved to Oregon where, at age 19, Alexandra exhibited mysterious symptoms that worried her family and new doctors. Daly said that she found it nearly impossible to obtain her daughter’s early brain scans to share with the neurosurgeons at Oregon Health and Science University Medical Center, so they could compare the large mass they were now seeing on Alexandra’s tonsil with images of the brain-stem bleed she had experienced as a child. Facing exploratory surgery for her daughter, since OHSU were unable to compare their images to earlier ones, Daly reached out to CHLA for help to quickly obtain Alexandra’s previous CT scans and MRIs from CHLA. “We were one of the first families to use the NexGenic app in an emergency situation, and it was an absolute life saver,” she said. Alexandra’s imaging records from CHLA showed doctors in Oregon that the mass they were seeing on their scans was actually an abscess that had been there for many years, and not a tumor. “If we hadn’t been able to get these images quickly, my daughter would have faced unnecessary, invasive and potentially dangerous surgery,” Daly says. She and Alexandra now have the imaging records stored on their personal cloud storage and accessible on their smartphones; the information is at their fingertips should they ever need it. Use our Express web app to save your facility time and money in the way you import outside facility images. Distribute image CD intake across your organization and streamline the process with quality control viewing, patient identifier recoding with data harmonization, and PACS archiving. 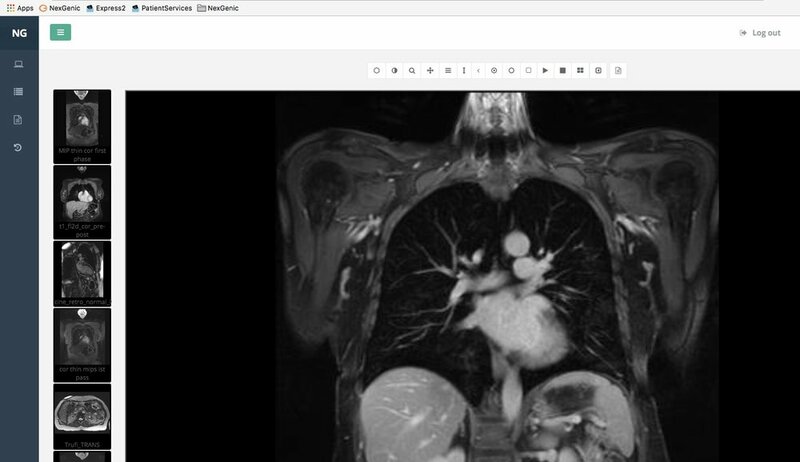 Have patients and doctors use the external web upload feature to securely transfer image exams to your facility. NexGenic customers use our hybrid-cloud tele-consultation platform, featuring a shared patient worklist, to achieve distributed image review workflows for Radiology and other imaging specialties. Use our apps to seamlessly capture data from acquisition modalities and securely exchange to our tele-consultation platform. The platform dashboard provides many simultaneous reviewers to securely review image exams. The system is 100% HIPAA and GDPR compliant. Using our suite of storage, exchange and viewing solutions, our NexGenic tele-consultation platform is able to support any customized workflow for image exchange and remote diagnostic review.